A lot of people regularly ask me what Linux distribution they should use. Naturally, I always tell them to use the one they are the most comfortable with. Of course, some applications, most notably Oracle software, are certified on only a few distributions so, if the objective is to have, say, the Oracle Application Server running, the choice of the distribution is limited. On the other hand, if the objective is to have a server running an open-source software such as the Apache Web Server, then there is no restriction at all: you can use whatever distribution you would like. Personally, I tend to favour CentOS Linux. The reason is that, over the years, I have become quite knowledgeable in RedHat-based Linux distributions such as RedHat Enterprise Linux (RHEL) but I prefer using a free Linux distribution as opposed to pay for support. Next week, we will run a Linux training at Knowledge7 and the distribution we will use is CentOS Linux 7. For historical reasons, I also use Debian Linux on some of my cloud-based servers. A few years ago, there was no automatic migration path from one version of CentOS Linux to another (e.g. from 5 to 6) and I couldn’t accept having to reinstall an operating system from scratch each time a major version was released. This is why I chose Debian Linux which, since it’s inception twenty years ago, can be upgraded to the latest version just by issuing the appropriate command. For the past ten years, Debian Linux has been rock-solid on my servers and there is absolutely no reason for me to change if it ain’t broke. We Linux enthusiasts sometimes forget that other open-source (i.e. free) operating systems exist. One good example is FreeBSD which is a descendant of the original UNIX (by Dennis Ritchie and Ken Thompson) and which is adored by its users. 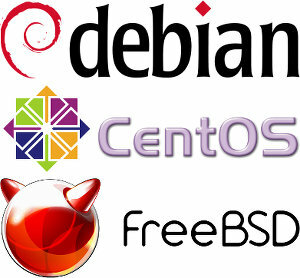 All usual open-source software run very well on FreeBSD including web servers, databases, etc. I know quite a lot of people, in Mauritius and elsewhere, who run FreeBSD on their production servers and they are very happy. What is interesting with the open-source ecosystem is that we can try multiple operating systems for free before we decide.